Get the free Sanctum Secorum #22 Companion HERE! Per Hiero Desteen is a priest, a telepath — and a highly trained killer. Five thousand years after the holocaust known as The Death destroyed civilization, Hiero explores the mutant-infested wilderness of Canada and North America, riding a mutated, telepathic moose named Klootz. The Abbey has attempted to establish colonies, but the evil Brotherhood of the Unclean was waging all-out war against the few remnants of normal humanity, determined to wipe out all traces of its emerging civilization. Hiero’s task was to bring back a lost secret of the ancients that might save the humans. His eventual allies include Gorm, a telepathic black bear, and Luchare, a princess from the distant kingdom of D’alwah. But his path lay through the very heart of the territory ruled by the Unclean and their hordes of mutated, intelligent, savage beast followers…and the Unclean were waiting for him! Welcome to the Sanctum Secorum podcast. Tonight is part two of our marathon-long Gary Con special episode! 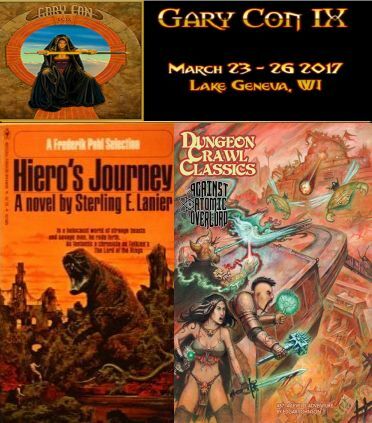 Ernie Gygax rejoins us as we discuss Hiero’s Journey before moving off into the realm of DCC. As a programming note, the Companion ‘zine for the Gary Con special will release POST Gary Con (likely within 48 hours of this going live). * February 12th Jeff Goad is running the DCC Lankhmar adventure, “the Madhouse Meet” at the Brooklyn Strategist. The game starts at 4pm. * Troy Tucker is continuing to run DCC RPG sessions at the Magician’s Forge in North Port, FL. Gary Con banner art used with permission of Luke Gygax and Gary Con. DCC Lankhmar Kickstarter is Live! Another fantastic listen, as always, and it is nice to get a window into the early days of the hobby! The Bounder in Crawling Under a Broken Moon #7 is based off of the hoppers in Unforsaken Hiero. Hiero’s Journey is discussed in Dispatches from Raven Crowking #1. I suspect that the vast marshes of the Palood were a consideration in The Sunken City. I know that they were in The Folk of Osmon. Riffs on the gigantic intelligent fungi, House, appear in The Folk of Osmon, Silent Nightfall, and The Giggling Deep. I suspect that this is an influence in Paul Wolfe’s The God-Seed Awakens as well. Although done with magic (because fezzes are cool), a telepathic link to a bear appears in The Ooze Pits of Jonas Gralk.